Moore finds a galvanizing climax by rallying around the notion that idealism trumps, if you’ll pardon the word, defeatism. 119 min. IMG Films. Director: Michael Moore. Cast: Michael Moore. American politics of the last decade have largely been defined by the tension between “Yes We Can” and “No We Can’t,” and as our current election cycle heats up, the Democratic debate has become one of Hillary Clinton’s stay-the-party-course practicality versus Bernie Sanders’ progressive idealism. 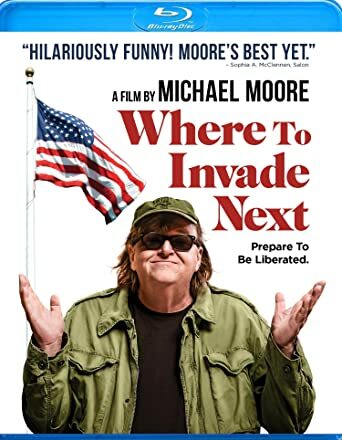 Liberal media icon Michael Moore has officially endorsed Sanders, but even if he hadn’t, we could’ve guessed where his sympathies lie on the basis of his latest film, Where We Invade Next. Setting a spritely tone, Moore’s first feature film in six years puts the lie to American exceptionalism by suggesting that we’ve exported our best ideas and misspent our plenty, throwing trillions of dollars at lost war after lost war instead of taking care of our own. The director, producer and on-camera personality frames his documentary picaresque by side-eying the U.S. military-industrial complex, then setting off on his own to scout for the best countries to “invade.” As he tools around Western Europe and, for a spell, Tunisia, Moore beams and plants an American flag wherever he finds an inspiring idea to plunder and bring home. Italy boasts its weeks of paid vacation, five-month maternity leave, and two-hour lunches. Finland shows off its number-one education, Norway displays its humane prison conditions, and Portugal touts its abandonment of a war on drugs in favor of free universal health care, a policeman explaining, “Human dignity is the backbone of our society.” And in a funny and jaw-dropping tour de France, Moore finds healthy, locally sourced four-course meals being served in an elementary school cafeteria, at a lesser cost than the typically unhealthy American fare. And where he finds dedicated women’s rights and economic justice (prosecutions included), they look pretty attractive too. Moore’s entertaining shtick can play like a super-sized episode of one of his TV series (TV Nation and The Awful Truth), but that’s not a bad thing. Yes, looking too closely at Where to Invade Next reveals that it’s a bit haphazard and a whole lot simplistic in its anecdotal approach to appealing social programs and government practices abroad, but Moore finds a galvanizing climax by rallying around the notion that idealism trumps, if you’ll pardon the word, defeatism. Maybe we can’t have it all, but we can live a little longer, feel a little better, and expand human rights instead of withholding them. We can have Moore instead of settling for less. Starz/Anchor Bay unleashes Michael Moore's Where to Invade Next in a not-so-special edition, but one that adds to your Blu-ray library one of Moore's best films, in solid high-definition A/V. The picture quality is as good as to be expected from the shot-on-the-fly digital source material, which is to say, sharp, colorful, and a tad unstable from time to time. The odd bit of aliasing or digital noise is no bar to enjoyment of the film, and in some ways, it contributes to the air of realism we want from a documentary aesthetic. The greater impression is the film's bright and detailed look. The Blu-ray disc backs up its pleasing picture with a better-than-serviceable lossless Dolby TrueHD 5.1 mix. One doesn't expect much in the audio department from a chatty documentary, but this one does seem to go out of its way to engage the eardrums with music, special effects and, most surprisingly, some actual immersion in rear channels, namely in the placement of the effects and, in one news montage, the discretely arranged voices of anchors that, in a lazier, muddier mix, would be one front-and-center babble. It's too bad that Anchor Bay didn't see fit to (or couldn't?) include the film's trailer, at minimum, or any deleted scenes, but it's still a gift to get Moore's latest in the Blu-ray format at all. All site content © 2000-2019 Peter Canavese. Page generated at 04/18/2019 11:30:49PM.